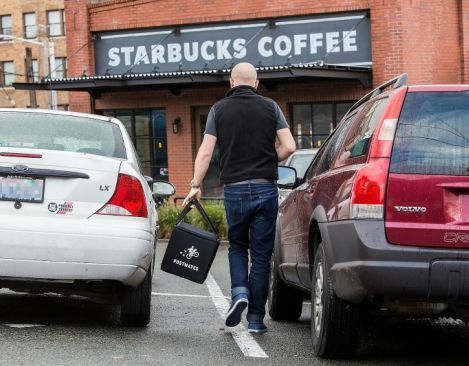 Starbucks is piloting an on-demand coffee delivery service in partnership with startup courier firm Postmates, starting in its hometown of Seattle. Having already tested it within the Empire State Building in October, the company is looking to establish whether it can deliver to homes, football pitches and offices across an entire city. Given the urge with which one might like a coffee, or the ease of popping out to grab one, this immediately feels about as convenient as waiting ‘between 9am and 5pm’ for a new sofa to arrive. This could work well for scheduled, future coffee incidents, but it remains to be seen whether supply can meet demand. Your order is placed with your closets Starbucks, which really begs the question why you can’t just go yourself. The offer of delivery has only gone live on iOS for now, just tap select, order, then delivery and enter the address. It’ll cost you an additional $5.99 per go, plus tip. If you’re standing in a Starbucks and see a man jumping the line, it may well be one of Postmates’ couriers, who will be cutting in to make sure he gets to his destinations on time. He’s being tracked in-app. If you’re one of the many Starbucks baristas that is fucked off enough already, perhaps one who purposefully writes ‘Jessy’ instead of ‘Kirsty’ on the cup, this influx of orders could be one competing demand too many. Particularly given customers can already pay ahead using the app and then also jump the queue. Quit and be a rockstar.